I (Mike Baird) visited Guatemala for the second time with my daughter Sandy from 09 June 1997 to 21 June 1997. The center of our trip was once again the great Spanish language school "Casa de Espanol Xelaju" in Quetzaltenango - known as CEX. The staff and programs there are outstanding. Visit their web pages to see what they have to offer. The school has a very strong community service focus. See http://www.casaxelaju.com (new url 1998) (old url is http://members.aol.com/cexspanish/index.htm ) for CEX registration and program information. Juan Carlos Aguilar was the Web Master there. See http://www.casaxelaju.com/voces/archive/vols1to4/voces4a3.htm for a school newsletter, with good past information on the community they serve. Accompanying us on our voyage was Heidi Dauberman Aguilar, the very special and dedicated coordinator of the La Pedrera project, and the talented child I sponsor, Ana Fabiola Sutuj Aguilar (15). We visited Quetzaltenango, Panajachel, Lago Atitlan, Santiago Atitlan, San Lucas, Tecpan, Antigua, Tikal and Guatemala City. The following thumbnail photos are all from our trip. Click on any one to view a much larger version. All the photos together are about 8MB. I hope you enjoy these as much as I did. Feel free to use them as you wish. Sorry, they are only in alphabetical order by photo name, but the names are pretty self describing. 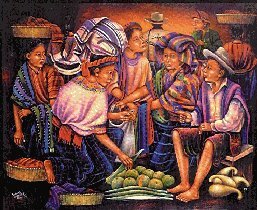 In 1998, another visitor to Guatemala and CEX, Alpha Marguerite Schram, sent me her web site address (dead 2002) http://www2.ucsc.edu/~pangolin/Xela/ , describing her visit. You may want to check it out -- it is very pretty and informative, in English and Spanish.